The first recollection I have of Al Darbyson was an encounter at Hurley’s Irish Pub one evening in March in the mid to late 1990s. In those days, the Marshals’ pre parade meeting took place in one of the many downtown pubs, quite probably Cheers! on Mackay Street in this case. I can’t recall the meeting, not for any reason of over consumption but because they all followed the same format. The Parade Director gets up, introduces everyone of special note in attendance, and goes over final details of the upcoming parade. 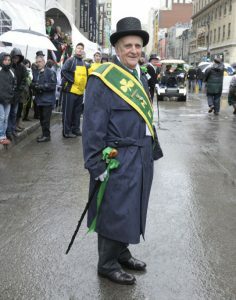 Questions are asked of the Parade Director, many the same by the same marshals year in year out. Although fantastic social occasions, it was easy for one meeting to blend into the next in my memory over time. Following the meeting a sizeable number of marshals retired to Hurley’s for a pint of their favourite beverages. As I approached the main bar to pay the pints for Al and several of our fellow marshals, he was having absolutely none of that to the point where he and I almost came to blows. With a 40 year age difference, cooler heads quickly prevailed. From that point, Al and I got along well. In searching through my records, the first mention I find of Aloysius is in the 1994 parade lineup booklet where he is listed as a marshal. Therefore the beginning of his relationship with the United Irish Societies has its origins sometime prior to March 1994. Al and Norma regularly attended events and Al was a marshal every year from 1994 until his health prevented such participation, regularly appearing in the marshals’ group photo from 2004 at the AMC Pepsi Forum. Norma passed away in February, 2000. We were all sad for the pain Al was going through and for the loss of our fellow member. Eventually Rena Brewster began to accompany Al to meetings, social functions, and to even join the organization and pitch in at the reviewing stand on parade day. They looked so happy together. Sadly, Al passed away on June 29th after a courageous battle. We will all miss him, his smile, his presence, his sense of humour, his dedication to our organization, his friendship. We will remember him. His name will be added to our memorial plaque prior to April 2017, joining the names of other members who have gone to their reward, including that of his wife Norma. Until we meet again, Al.